The mission of Art Properties is to encourage the study and research of works of art from the University art collection. As noted in a previous blog post, in 2013 we began a partnership with the NYU Institute of Fine Arts Conservation Center as an extension of this educational mission in support of object-centered learning. Not all forms of conservation involve in-depth cleaning and restoration. In some cases the primary concern is scientific study of a work of art in order to better understand its historical origins. 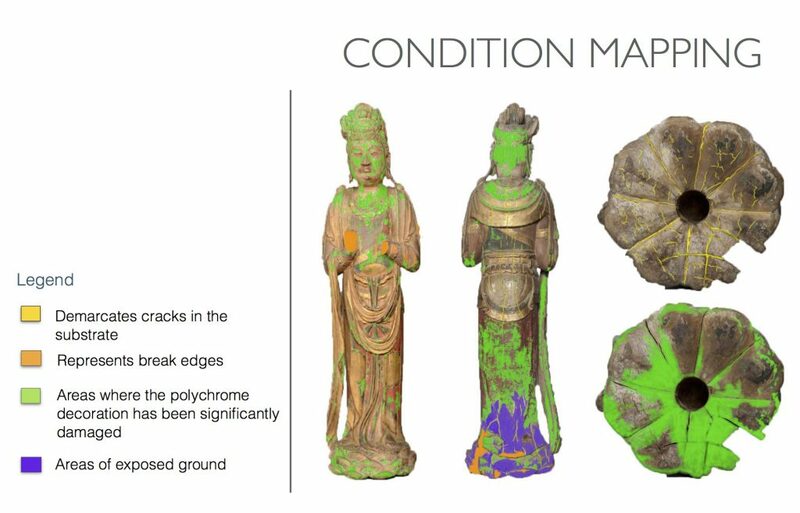 The following is an example of how technical analysis of a polychrome wood sculpture from the Art Properties collection has helped us further authenticate its origins to a particular time period and region in China. 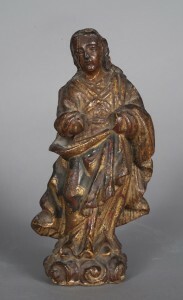 This conservation treatment of a Columbia University polychrome wood figure of a Bodhisattva sought to inform the history and manufacture of the object through technical analysis. A primary goal of the research was to determine the region from where the sculpture originated. In general, scholars have had to base attributions of Chinese Buddhist figures on stylistic analysis. This stems from the limited documentation that exists on the de-installation and sale of Buddhist icons during the nineteenth century. More recently, the application of technical art history to Chinese Buddhist wood sculptures has teased out an apparent correlation between wood species and region of production. Whereas willow, linden, and poplar are identified with regions from Northern Manchuria to Shaanxi, the foxglove tree, also known by its botanical name of Paulownia, grows more centrally in China from the Yangtze River westward to Sichuan. Thus, sculptures from the Liao (907-1125), Jin (1115-1234), and Yuan (1271-1368) dynasties are generally constructed from willow, whereas statues and figures attributed to the Song dynasty (960-1279) are often carved from Paulownia. The potential to secure the provenance of the Columbia University Bodhisattva warranted conducting wood identification on the sculpture. After discussing the cost-benefit of micro-sampling with Dr. Roberto C. Ferrari, Curator of Art Properties, permission was granted to obtain a micro-sample for analysis. Thin shavings were removed from a discrete location and were mounted onto glass slides to be observed under magnification. The analysis revealed that the samples possessed characteristics associated with Paulownia, a deciduous tree native to much of China, though most common in the region noted above from the Yangtze to Sichuan. Use of Paulownia was particularly prevalent during the Song dynasty. Thus, the results of the wood identification suggests that the sculpture may have been produced between the 10th-13th centuries. The identification of Paulownia afforded a tangential observation to be made regarding the relationship between wood species and consecratory chambers. 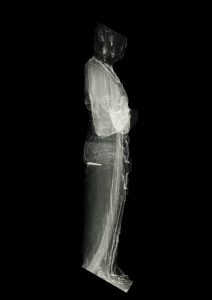 As part of the documentation process, the Columbia University Bodhisattva was imaged with X-radiography. In essence, X-radiography uses a high energy source to resolve the internal structure of an object. Examination of the X-radiograph revealed no consecratory chambers present in the Bodhisattva. Only Buddhist sculptures carved in willow have been found to contain consecratory cavities, while statues of Buddhas and Bodhisattvas carved from Paulownia have shown to have no such chambers. 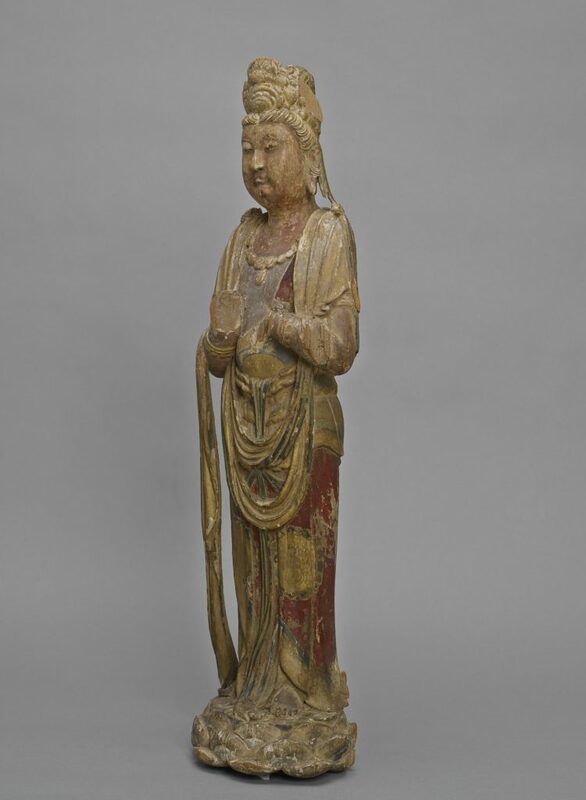 This discovery thus falls in line with recent findings noted by Denise Leidy, Donna Strahan, and Lawrence Becker in their text Wisdom Embodied: Chinese Buddhist and Daoist Sculpture in the Metropolitan Museum of Art (New York: Metropolitan Museum of Art, 2010, pp. 38-39). The ostensible specificity of consecratory material then raises an obvious question: Why do sculptures carved in willow bear consecratory chambers? One explanation may stem from Buddhist lore. The Bodhisattva of Compassion, Kuan-yin (also known as Avalokitesvara), is closely tied to the willow. Thus, the religious significance imparted to willow may explain its apparent relationship to consecratory material. This also may suggest, then, that the Columbia University Bodhisattva is not Kuan-yin but rather a different Bodhisattva whose identify remains unidentified. Ultimately, by studying the sculpture from substrate to surface, the conservation of the Bodhisattva demonstrates how technical analysis can guide decisions on how to approach treatment. Furthermore, the emphasis on research underscores how conservation can contribute to the body of knowledge on art history. This entry was posted in Art Properties, Conservation on August 10, 2016 by Ted. In Fall 2013, Art Properties began a program with the NYU Institute of Fine Arts Conservation Center to loan objects from Columbia’s art collection to the IFA CC so that students could benefit from object-centered learning. The IFA CC offers graduate degrees to students interested in the technical study and preservation of art and cultural heritage objects, such as paintings, sculpture in all media, and ceramics. Each semester one or more professors from the IFA CC have coordinated with the Curator of Art Properties to select works related to courses taught that semester. Examples to date have included the study and preservation of polychrome wood sculpture, as well as marble and bronze figurines. This treatment of the Spanish Colonial Virgin from the 18th century was completed as part of my training in the Polychrome Sculpture seminar with Professor Michele Marincola at the Institute of Fine Arts Conservation Center of New York University. I received the small statuette without any knowledge of its specific historical context or materials. As a result, the amount of information I gained in the examination and technical analysis of the object was significant. Although there are many interesting details of the treatment, research, and analysis of the statuette, this summary will deal with only one aspect of the treatment: the reversal and rejoining of the old repairs in the face of the figure. Previous repairs to the face were failing. Small flakes of adhesive were loose in the join and the proper right segment of the face was visibly misaligned. In order to restore physical and visual integrity to the work, the adhesive in the join was reversed with ethanol and water and the old adhesive and insect residue on the surfaces were cleaned and slightly contoured to their proper alignment. 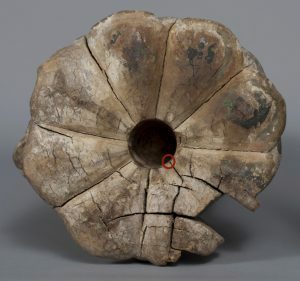 The reversal of the old join revealed three things: the extent of the (dormant) insect activity in the form of worm holes and larva; the manufacturing method of securing the glass eyes in a ball of resin within a carved socket; and that the join consisted of three pieces instead of the previously-believed one piece. The procedure of reversing the join, cleaning surfaces, and shaping the dry-fit of the three pieces into their proper alignment were completed with time, consideration, and significant restraint in order to achieve the best possible results. 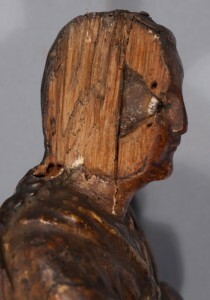 The rejoining of the pieces back onto the statuette also had to be done quickly to ensure the adhesive was still tacky. The process was a quick and efficient race of warming the surfaces, adhesive application, and clamping the join. Because this task would only take a minute or less to complete, it was necessary to practice ahead of time the order of the pieces to be adhered and the placement of the clamps so that any kinks in the process were considered and resolved prior to the treatment. The surfaces were slightly heated with a radiant heat tool to encourage the affinity of the surfaces to the also-warm adhesive. Next, the warm adhesive, a 30% hide glue in distilled water, was applied to the surfaces with a brush, and the pieces were re-adhered to the statuette. Pressure was applied to the joins by using small clamps to ensure that the surfaces were properly connected. The clamps were left in place for 24 hours, then removed and inspected. The success of this phase of the treatment was thrilling. 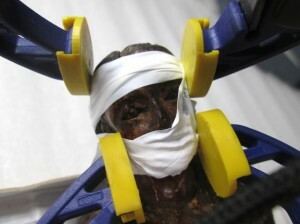 The treatment achieved the goals of restoring physical and visual integrity to the statuette and provided an ideal educational scenario to employ future treatment methods. This entry was posted in Art Properties, Conservation on February 23, 2016 by Ted.